Faaborg Værft (Shipyard) A/S is behind a new electrical ferry that acts as a water bus in Stockholm. The combination of electrical motors and robust, composite raw materials, supplied by ICOM, ensures that the ferry meets modern demands for lower pollution, less noise and cheaper running costs. 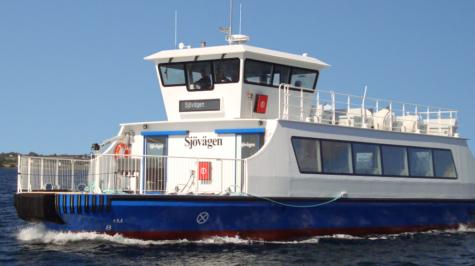 “Sjövägen” is a new, modern, electric ferry in the Archipelago of Stockholm. Eight times a day, it transports up to 150 passengers on waterways when they are going to work, school, to study, or for sightseeing. Faaborg Værft designed and built the ferry, and ICOM supplied all of the composite materials. The composite material, PVC sandwich, is used for the command bridge, the surface of the vessel and the ship’s hull. It is one of the main reasons why the ferry’s weight was so considerably reduced compared to traditional ferries. At the same time, the use of composite materials means that the ferry can retain its structural integrity and that the surface does not lose hardness or strength, and that the ferry looks pretty and is well-maintained year after year. The reduced weight and use of electrical motors also have the advantages that both the noise and environmental impact decrease compared to the use of ordinary, internal combustion engines. “Sjövägen” was specifically developed for the waterways in Stockholm, and is the company, Ballerina AB’s, fourth ferry but their first electric ferry. In all, they have 4 ferries that are used as public transport in and around Stockholm.